Green tree snake is a common, harmless snake. 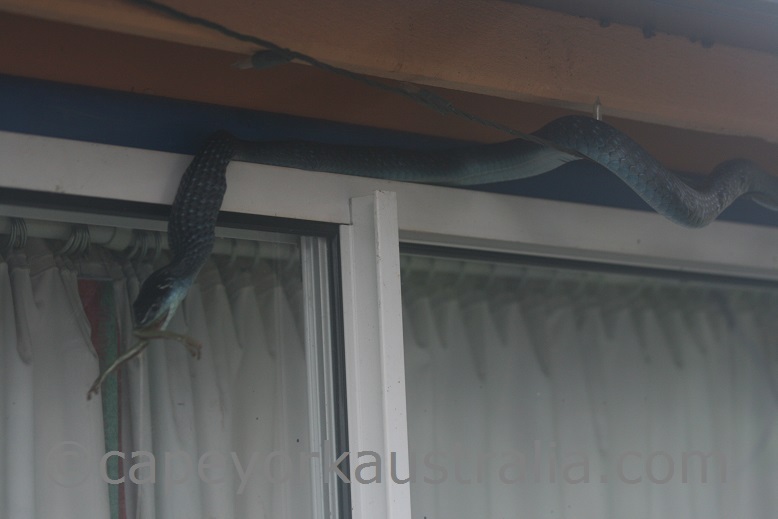 Also called common tree snake (even Australian tree snake, grass snake, yellow bellied black snake), Dendrelaphis punctulata is a beautiful snake that is totally non venomous. 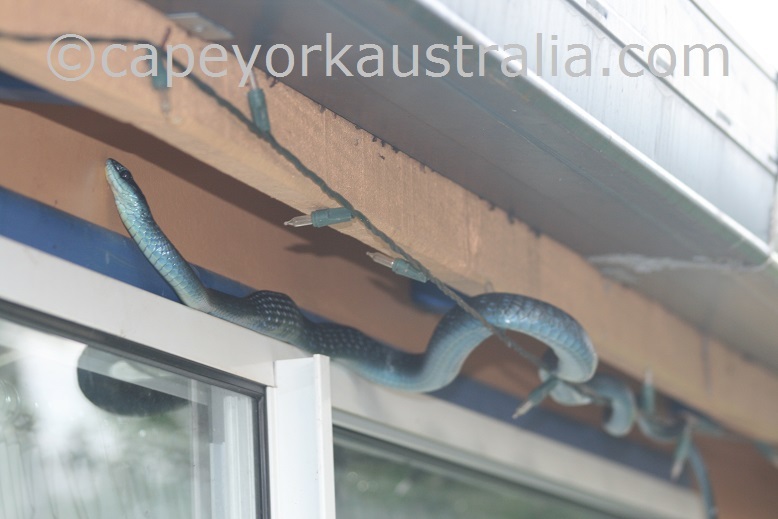 It is sometimes confused with the green tree python (also harmless) that is endemic to Cape York, while the common tree snake has a much wider distribution in the whole northern and eastern Australia. The two also belong to different families and at a closer look, look very different. Another difference is that the green tree snake is diurnal (active during the day) while the green tree python, like most pythons, is nocturnal (active during the night). What Does the Green Tree Snake Look Like? It is most commonly 1.2 metres long, but can grow up to two metres. As its name indicates, most specimens are green. Also common are yellow shades, particularly on the throat and under belly. Yes, green tree snake can also be black, brown, olive, or even blue (greyish to bright blue), the latter particularly found in the tropics. It has a slender body, a small head, a long, thin tail, and large eyes. Even if the belly is not yellow, it can be creamy, grey or blue but is always paler than the back. 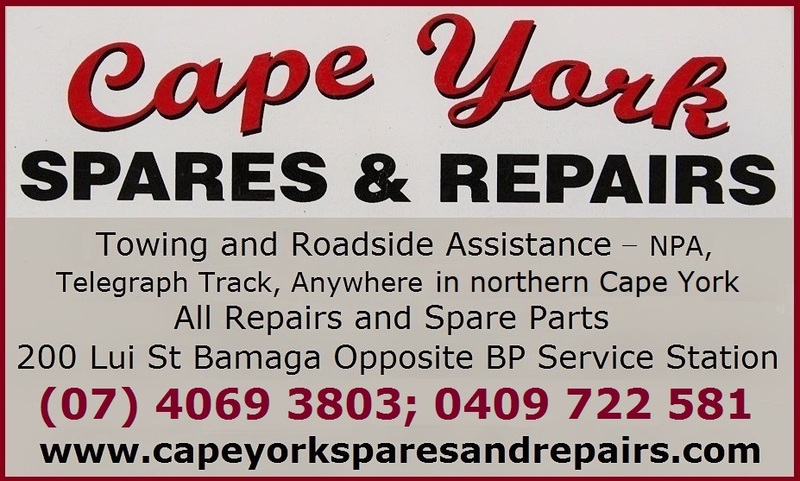 It is found in northern Australia, from the Kimberleys in the west to Cape York in the east, and down along the eastern coast of Australia throughout the whole coastal and sub coastal Queensland and about half way into New South Wales. It is also found in our northern neighbour Papua New Guinea. It lives in a wide variety of habitats like rainforests, sclerophyll forests, eucalypt forests, open woodlands, bushlands, heathlands, shrublands, rural lands and farmlands, as well as urban areas, suburban backyards and gardens. Catching a green tree frog. Where to Look for a Green Tree Snake? Like most snakes they are more likely to be seen near creeks and rivers, lakes and garden ponds, in other words wherever there is water. And like most snakes they like high grass where they are protected from predators, and likely to find prey. 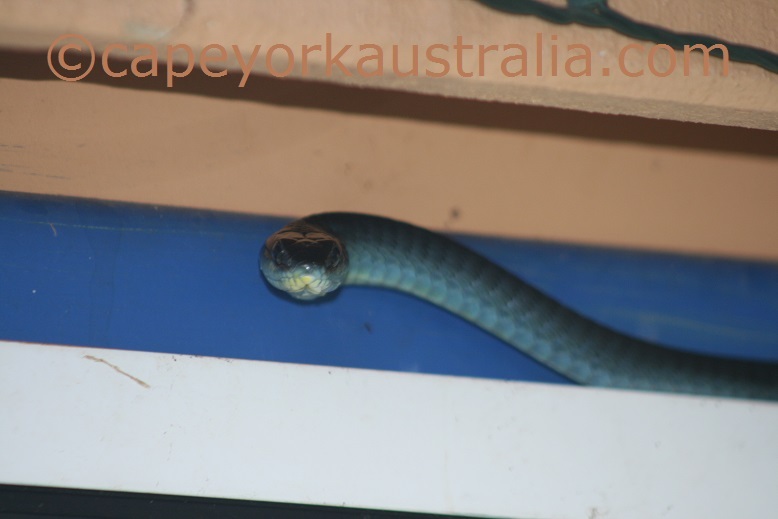 Like other tree snakes they also like to spend time in trees, and elsewhere above the ground, like on buildings, house verandahs, walls and roofs of garages and sheds. They are one of the most common species of snakes to enter gardens and homes, and they love dog food if it's laying around! Eating a green tree frog. Unlike many other snakes, they rest during the night in rock crevices, hollow logs and other hideaways, and keep awake day time, when they hunt or sunbathe, often up in trees. Their favourite food is frogs but they also eat fish, small reptiles (skinks, geckos, even turtle hatchlings), eggs, and small mammals such as rats and baby bandicoots. Around homes they love house geckos. About 5-12 eggs are laid per clutch, and hatchlings are about 25 cm long. Giving me an agitated look. If they are in the bush and realise you are watching them, they simply escape to safety. 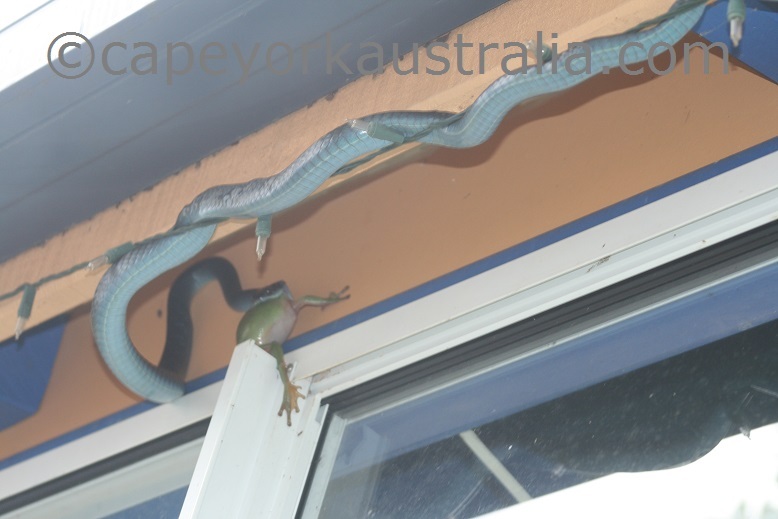 The one on the photos on this page appeared right in front of us (despite the fact we weren't quiet), got the frog, spent about half an hour swallowing it, all in the touching distance from us, right in the height level with our heads. I could have given it a kiss, it was that close. After eating, though, he did show signs of disliking us so close, and gave me that look with slightly inflated neck to scare me away. They can also emit a strong smell as a defensive mechanism, and of course, they can bite. The fact that a snake is not poisonous does not mean it cannot give you a nasty bite!